Albert Heijn, the leading supermarket brand in the Netherlands, is taking grab-and-go convenience to the next level. 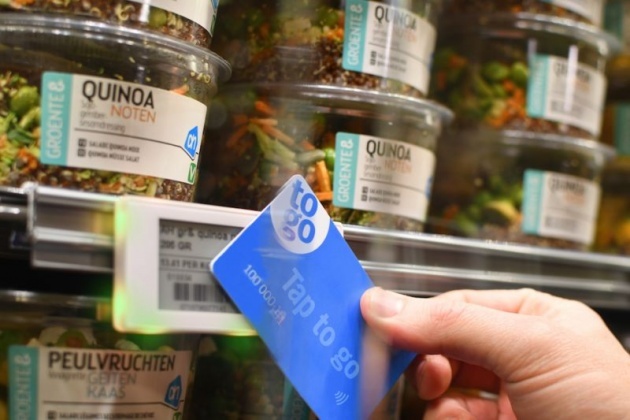 Beginning this month, Albert Heijn is testing "tap to go" technology at one of its AH to go stores, allowing customers to pay for items without going through the checkout. The technology, which is being piloted at the AH to go store at Ahold Delhaize’s support office in Zaandam, provides customers with a fast, efficient shopping experience by using a card or, in the near future, a smartphone. After registering via an app, customers can select an item, tap an electronic shelf card, and go. Within 10 minutes, the money will be automatically transferred from their bank account. The test started less than six months after the plan was announced, faster than previously anticipated. “Technology is changing rapidly. So why wait?” said Jan-Willem Dockheer, Managing Director of AH to go. “The sooner we can start, the more we can learn.” “Tap to go” is being developed in collaboration with technology providers and a bank. It will be rolled out to other AH to go stores in the Netherlands by June 2018. AH to go is the convenience store format of Albert Heijn, offering high-quality, healthy and delicious food on the go. The format was launched 15 years ago, with 76 locations across the Netherlands.